Every year at this time during National Library Week, we get an update on the state of the nation's libraries. 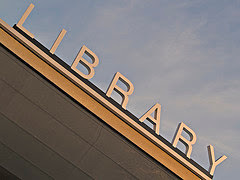 According to the ALA's newly released State of America's Libraries Report 2008, "New studies provide solid evidence that the nation’s public libraries are engines of economic growth, contributing to local development through programming in early literacy, employment services and small-business development. Other studies show that libraries provide an excellent return on investment, have a measurable positive impact on the local economy and contribute to the stability, safety and quality of life of their neighborhoods." Given these stellar results, it makes me wonder why we are not better at supporting libraries in our communities? Budgets in some areas are in free fall. Hours of operation are being curtailed. Programs are contracting rather than expanding and staff positions are being eliminated. Perhaps we could be a better, healthier, smarter nation if we increased our investments in preventive measures like getting kids excited about reading and learning before they turned to gang activity instead of building state-of-the-are prisons on the back end. Perhaps we could create communities that engage in healthy, informed debate instead of polarizing rhetoric. Perhaps we could even turn off all our electronic toys for an hour a day and not only read ourselves but encourage others to read for pleasure and the pleasure of learning new things. Perhaps.